Well, today is the day I’ve been waiting quite some time for. I just sent a $508.13 payment to Chase and effectively eliminated the very last of my credit card debt! I received my first credit card, the first one that wasn’t attached to my parents’ account, back in the summer of 1997. The very first thing I purchased with it was a computer from Dell. That $4k computer served me pretty well, allowed me to start my own company, and held it’s own until 2001. In fact, I’m still using the monitor from that computer purchased back in 1997. I’m pretty proud that my first purchase wasn’t one I regret. But the rest of the purchases I made on that credit card, and the numerous others I’ve used since, haven’t all been such profitable or wise decisions. In 2000, I took a personal vacation that cost $7k, financed entirely on a Visa card. Can you believe that? The crazy part, while I have fond memories of it now, at the time I didn’t really enjoy it all that much. To date, it stands out as the biggest and most frivolous 10 day spending-spree of my life. Since I purchased my house, just 6 years ago, I’ve bought a new furnace, a new washer, a new dryer, I’m on my third (!?) refrigerator, a new roof, new siding, new doors, lots of new furniture and I charged every single one of them. I’ve also charged well in excess of $50k on game used hockey jerseys over the years. Thankfully, they tend to hold their value and often increase in value. It’s tough to call that a stupid expenditure when I really enjoy it and the option is always there to sell them, but at the same time, the amount of money I’ve thrown towards it over the years is staggering — especially when I was casually using a credit card to finance it because I really couldn’t afford it. One of the most intelligent things I’ve done using credit cards was financing last year’s home improvements by spreading it out across multiple cards and taking advantage of promo offers. In the end, I believe we financed the entire project just above 4%. The previous year when we went the more traditional route, taking out a home improvement loan to finance the roofing project, the rate was a ridiculous 15.5%. As a result, in the future, credit cards will be my financing method of choice when an expense comes along that I can’t afford. That is, if they still offer the nice promo rates in this “new” economy. If you click on the chart above, as recently as June of 2007 (less than a year ago! 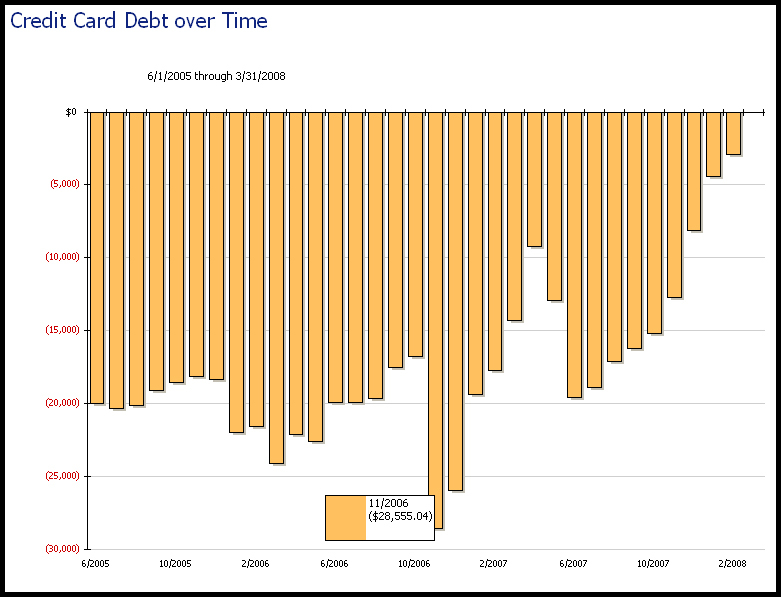 ), my total credit card debt was near $20k. It feels good. Even had a little extra spring in my step as I walked into work this morning. That’s GREAT! Congratulations! Keep that spring in your step! That is fantastic news and a very admirable accomplishment. Congrats!! WOW! I am so excited for you! Here’s to FREEDOM! I need to start seriously swinging at mine. Congratulations. Thanks everyone — it feels great! I’m just hoping I can stay the course on the savings side. Congratulations on the credit card payoff! That’s awesome! I found you thought Tricia’s blog (Blogging Away Debt) and look forward to catching up on your story. Wow! This is super impressive! That’s excellent! Congratulations on your wonderful achievement.